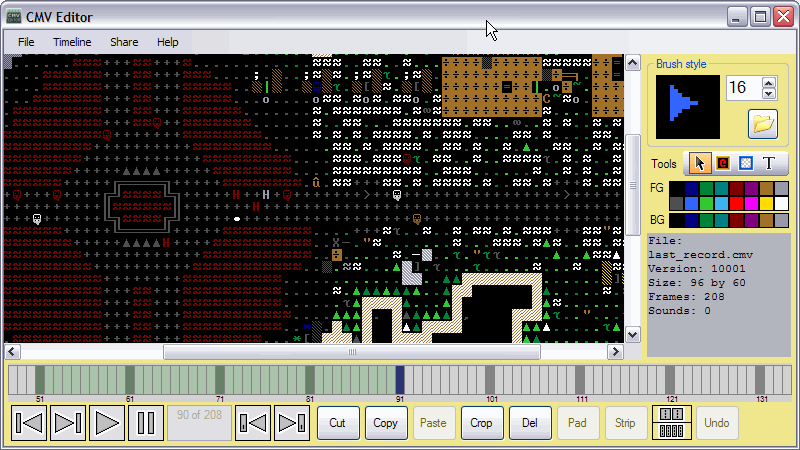 The CMV Editor is a movie editor for CMV movie files produced by the game Dwarf Fortress. This software is still very buggy, there are known issues with the timeline and organisation of frames that are being looked into. Update: (2013-05-14) The source code for the CMV Editor can now be found on Github! https://github.com/Markavian/CMV-Editor. Anyone interested in making improvements please get in touch! Can load and playback CMV files. Has an interactive timeline that allows segments to be cropped, cut, copied, pasted, deleted. Buggy timeline, doesn't always point to the right frame after different operations, it will annoy you greatly. Sorry. Feel free to share / display your movies by submitting on DFMA Add Movie page.